Braun Tassimo Coffee Makers and the Braun Tassimo 1400 Coffee Maker For Your Morning Wake-up Call. Braun Tassimo Sometimes when you come home from a hard day at the office you're looking for more than just a cup of coffee. Imagine something that can help you make everything from hot tea to cappuccinos in minutes, at a fraction of what you would pay at a coffee shop, and with very little cleaning involved. Like its packaging statement says, the Tassimo 1400 really is a "revolution in home brewing." Probably the best thing about this beverage maker is that it can make a variety of hot drinks, including coffee, tea, espresso, hot chocolate, and even cappuccinos and lattes. This beverage maker can handle it all. Why limit yourself to a device that only makes coffee when you can have a Braun Tassimo 1400 and make anything you want. 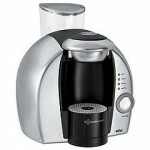 Besides making a variety of drinks, the Tassimo 1400 is also very easy to use. With the touch of a button, you can make whatever you're in the mood for. You don't even have to make an entire pot of coffee - the Tassimo 1400 let's you make your drinks one cup at a time. Cleaning is also a cinch with this beverage maker. Since everything you need is contained in a conveniently packaged T-Disc, cleaning is minimal. To make its drinks, the Braun Tassimo 1400 uses what are known as T-Discs. These discs represent one of the drawbacks of the Tassimo 1400, mainly because there are only so many flavors that the company makes. Basically, you're stuck drinking whatever flavored drink the manufacturer wants you to. Additionally, these discs can be relatively expensive, and since you need one disc every time you want to make a hot drink, it can really start to add up after a while. On average one T-Disc, which makes one cup of any particular hot drink, costs about $1. Still, when compared to the price of a cup of coffee or tea at your local coffee shop, there are those who would agree that the price can't be beat. For convenience and variety, the Braun Tassimo 1400 Coffee Maker has become one of the must-have items for a home kitchen or a small business office. Don't expect to put your local coffee shop out of business, but with the touch of a button, you can enjoy high-quality hot drinks without having to pay an arm and a leg for them.